BLITZFIRE MONITOR Flow range up to 500 gpm (2000 l/min). The monitor features low friction inlet and outlet pivots. Outlet has built-in stream shaper. 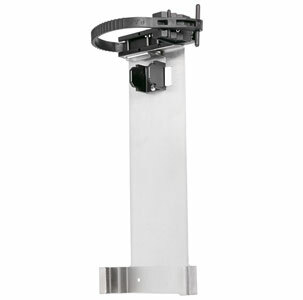 Elevation is manually adjustable between 10 and 46 degrees above horizontal. Horizontal rotation is manually adjustable 20 degrees either side of center. The SAFETY SHUT-OFF VALVE will shut off flow if monitor slides or lifts. 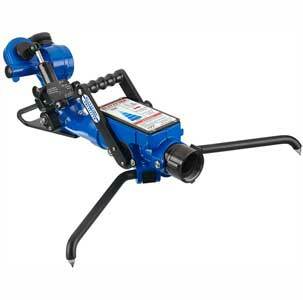 It has six detent flow positions with a patented turbulence free slide valve for operator flow control. When the legs are folded, the carbide tips point up for carrying safety. The heavy-duty carbide tipped legs are easily folded out to a wide deployed stance. Stowed in storage bracket overall size is 29.5"L x 8.1"W x 8.5"H (74.9 x 20.6 x 21.6 cm). 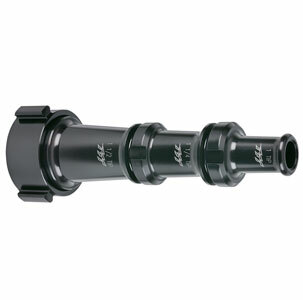 Standard inlet is 2.5" NH (65mm) rocker lug swivel coupling. Standard outlet is 2.5" NH (65mm) rigid male threads. BLITZFIRE OSCILLATING MONITOR Flow range up to 500 gpm (2000 l/min). The monitor features low friction inlet and outlet pivots. Elevation is manually adjustable between 10 and 46 degrees above horizontal. The water driven turbine makes the nozzle automatically sweep 10, 15, or 20 degrees either side of center. The oscillating mechanism can be disengaged and horizontal rotation moved manually. The SAFETY SHUT-OFF VALVE will shut off flow if monitor slides or lifts. It has six detent flow positions with a patented turbulence-free slide valve for operator flow control. When the legs are folded, the carbide tips point up for carrying safety. The heavy-duty carbide tipped legs are easily folded out to a wide deployed stance. Stowed in storage bracket overall size is 34.8"L x 10.5"W x 9.6"H (88.4 x 26.7 x 24.4 cm). Standard inlet is 2.5" NH (65mm) swivel rocker lug coupling. Standard outlet is 2.5" NH rigid male threads. BLITZFIRE MONITOR Flow range up to 500 gpm (2000 l/min). The monitor features low friction inlet and outlet pivots. Outlet has built-in stream shaper. Elevation is manually adjustable between 10 and 86 degrees above horizontal. Horizontal rotation is manually adjustable 20 degrees either side of center. The SAFETY SHUT-OFF VALVE will shut off flow if monitor slides or lifts. 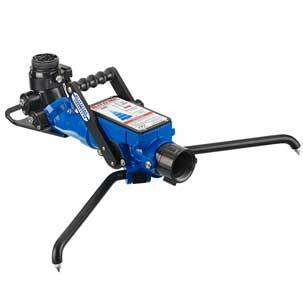 It has six detent flow positions with a patented turbulence free slide valve for operator flow control. When the legs are folded, the carbide tips point up for carrying safety. The heavy-duty carbide tipped legs are easily folded out to a wide deployed stance. Stowed in storage bracket overall size is 29.5"L x 8.1"W x 8.5"H (74.9 x 20.6 x 21.6 cm). Standard inlet is 2.5" NH (65mm) rocker lug swivel coupling. Standard outlet is 2.5" NH (65mm) rigid male threads. High Elevation Oscillating Monitor BLITZFIRE OSCILLATING MONITOR Flow range up to 500 gpm (2000 l/min). The monitor features low friction inlet and outlet pivots. Elevation is manually adjustable between 10 and 86 degrees above horizontal. The water driven turbine makes the nozzle automatically sweep 10, 15, or 20 degrees either side of center. The oscillating mechanism can be disengaged and horizontal rotation moved manually. The SAFETY SHUT-OFF VALVE will shut off flow if monitor slides or lifts. It has six detent flow positions with a patented turbulence-free slide valve for operator flow control. When the legs are folded, the carbide tips point up for carrying safety. The heavy-duty carbide tipped legs are easily folded out to a wide deployed stance. Stowed in storage bracket overall size is 37.3"L x 10.5"W x 9.5"H (94.7 x 26.7 x 24.4 cm). Standard inlet is 2.5" NH (65mm) swivel rocker lug coupling. Standard outlet is 2.5" NH rigid male threads. 3 STACKED TIPS Hardcoat anodized aluminum alloy for maximum corrosion protection. Flow charts for each tip are lasered. Tip sizes are 1.5", 1.25", and 1.0" (38, 32 and 25mm) diameter. Small tips may be removed for break and extend operations with a 1.5" NH (38mm) hose thread. Standard swivel inlet is 2.5" NH (65mm).